It's not literally made of walnut — that would make it box, not a case. 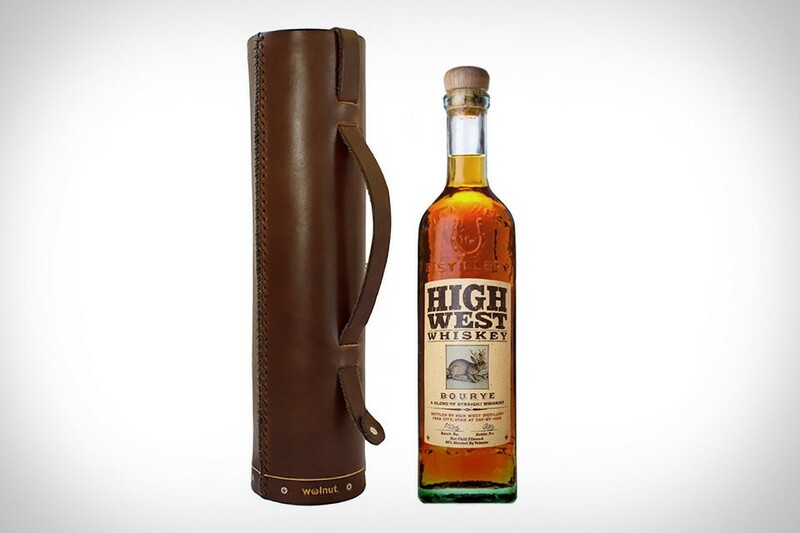 Instead, the Walnut Whiskey Case is hand-stitched and hand-dyed using USA-sourced leather in a Portland, OR studio. It features sustainable cedarwood ends to protect the bottle in the case, a strong snap to keep it shut as you travel, and a leather strap that makes it easy to carry anywhere. Comes with two leather coasters and holds bottles up to 12.25" tall and 3.375" in diameter. There are quite a few multi-purpose backpacks on the market today, but few can match the functionality of the City Premium 27-Liter Backpack from Timberland. It's water-resistant, and features an integrated battery pack to keep essential travel items — like your smartphone and USB charged devices — juiced up and ready when you need them. The battery is light, water and crush resistant, but most importantly, it saves you from being that guy sitting on the floor next to the nearest power source at the airport, and nobody wants to be that guy. If you've ever travelled with a suit before, you already know keeping it crisp and wrinkle free is nearly impossible. The C38 Suitcase from Vocier has the solution, though, with the space to not only fit all the clothes, shoes, shirts, and pants you need for a long trip, but also keep them wrinkle free. A removable interior allows for more space if you're not packing a suit, and there are easy to access compartments for everything from your dopp kit to your laptop. And everything is well protected thanks to impact resistant fiber-reinforced BASF plastic. Ideal for short trips, the Lotuff Holdall Bag will carry your belongings safely and with style. Built using a mix of hand-selected, vegetable-tanned leather and top-grade duck canvas, it features a leather-lined bottom, large interior pockets, an interior zippered drop pocket, a full-length exterior pocket on each side, and an extended zipper for easy access. It's available in black, navy, or chestnut, and handmade in New England. Most of us load up our packs each and every day, with little thought given to essential things like access, storage space, and structure. Thankfully, the Three Pack backpack from Postalco has all of that covered, and a lot more. Not only does this original design keep the bag snug on your back without bulky frames or thick cushions that reduce space, but it is also thoughtfully divided into three large separate compartments. It also offers double leather-wrapped handles, a cushioned laptop pocket, and Postalco's proprietary Hammer Nylon fabric invented and made in Japan. Your Macbook is a cold piece of aluminum and glass. Give it a coat of natural warmth with an Ackermann Cattle Hide Laptop Case. Available for the 15" and 13" Macbook Pro as well as the 13" and 11" Macbook Air, these cases feature hide taken from Normande cattle, which it tanned in northern Italy, sturdy Swiss RIRI zippers, and a 4mm wool felt lining that keeps your Mac from getting scratched. For occasions when you don't need your laptop, it also doubles as a document carrier. Manufactured in Germany. A trusty Dopp Kit is an essential element for all travelers, but finding one that stands the test of time can be a real challenge. The Denim Dopp Kit from Boutonne is made with this in mind, featuring an oiled leather base to give it structural strength, and a heavy zipper for easy access. It's then all tied together with 10 Oz raw selvage denim. Proof that a Dopp Kit can be both functional and fashionable.